"How would you feel knowing that every time you started a new book project, you already had people excited to buy it and ready to recommend it to others?" That’s a lot if you are not a big name author or just starting out. Most book sales fizzle out at around 250 as it exhausts the extended family, friends and acquaintances network. After that, sales become a challenge. In the past, to reach a 1000 sales (and beyond) you would need PR and marketing. Maybe hire an expensive publicist and go on a nationwide book tour. All expensive investments. None guaranteed to work. The internet has leveled the playing field, providing cheap and accessible tools to replace traditional marketing methods. And it all starts with building your own platform. 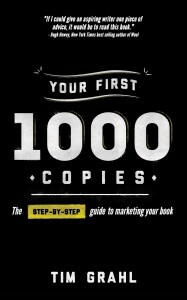 With Your First 1000 Copies, Tim Grahl shows you how. "...the authors selling the most books today are those that are focusing first on planning and building their platforms." Long before launching your book, you must focus on building and establishing your own platform of readers. The vision of this platform is to connect your fans, spread your ideas, and share your journey using writing as the medium and enriching people’s lives. Exciting people so much about the art you produce that they are looking forward to your book release and are excited to tell other people about it. Having a strong, established platform of readers is the difference between writing a book and having a writing career. It is this audience that will support you by buying your books, with no more prompting than a simple email from you asking them to please buy. All the traditional, expensive and risky marketing is replaced with you forming long lasting, mutually beneficial relationships with your readers. "[Create] lasting connections with people through being relentlessly helpful." The first step in platform building is connecting and asking for permission to continue the relationship. If you do not do this then you have a leaky bottom in your bucket and lose potential fans that were exposed to your writing. You must have a way of plugging the holes where they slip through. And the most effective way to do this is through encouraging people to subscribe to your mailing list. Sounds old fashioned, but a mailing list is far more valuable than the same amount of social media followers. Although social media is more popular – email is more effective, as social media converts very poorly into sales. Email does better as it the place online people spend most of their time. Creating and growing your mailing list should be your number one priority. Tim urges us to rather look at social media as a way to funnel people through to sign up to our mailing list – and so giving us permission to market to them. Your next step is creating content that is helpful to your potential readers and fans. Content that people crave, enjoy and share. Through blogs, audio, video, guest articles, and so on. This is where you build and establish the trust – to get people to actually open your emails in the first place because they know your content is helpful. Do not be scared to give away your work for free. Share too much rather than too little. This might be very tough to understand but overprotecting your work and not sharing will do much more harm. Authors that release digital formats for free online only drive sales higher. So, giving freely does not affect the bottom line negatively, and actually does the opposite. Obscurity is the real enemy. Now you are building relationships with your readers, and you are providing free, generous and helpful content to build trust. This is good, but not enough. You need to amplify and accelerate your platform building. You need to start being helpful not only to readers, but influencers. People with bigger audiences that can rapidly help you grow your platform. Readers and influencers are different groups. What is helpful to a reader is not (necessarily) helpful to an influencer. Identify with the feelings and needs of the influencers you are trying to reach out to. Have empathy. Always ask how you can help the influencer get what they want. And then be relentlessly helpful. If you are so desperate on selling you only focus on yourself – resulting in you not selling. Rather go help people get what they want out of life. Your aim should be on helping them, not just yourself. Always focus on long term relationship building when reaching out. Never focus on a short term gain. So, you are attracting readers with generous content, capturing their permission to stay in contact and reaching out to people, finding out how you can help them and accelerate your platform building. Now you need to sell. "...you have to ask for the sale. It’s as simple as that. There’s nothing to be ashamed of in asking to be compensated for your hard work. If the offer is fair, then everyone benefits." You have to be your own best fan. You have to be excited about your book. If you’re not excited about your own work – why should the reader be? So, be proud and ask for the sale. If you built your platform on being relentlessly helpful, then the sales part will feel natural and not sleazy. Your readers will not feel like you are selling out. Rather, they will feel they are offered a chance to support you to continue your writing and produce further works they will enjoy. A mutually agreeable transaction. Beautiful. Your platform is now supporting your writing career. They already cannot wait for the next book to come out. But, you are not quite done yet. Through all this connection, relationship building and selling – you need to track your analytics and key indicators. Measure how successful your connection strategies are working. Are you reaching your fans in a meaningful way? What does and does not work? If you can track something you can improve it. With email, the key figures you should be looking at are: open rates (25% is a good open rate), click rates and subscriber rate. For your website, the key figures to watch are number of visitors, page views, popular pages and referrers. I’ve already started building my own platform through my blog. Slowly, but surely it is growing. How far are you with your platform building? 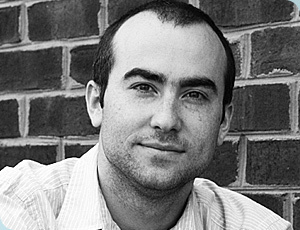 Owner of Out:think, a firm that helps authors make money.